Play if… Willy Wonka and the Chocolate Factory (or Charlie and the Chocolate Factory) is one of your favorite movies. Avoid if… you’re lactose intolerant, diabetic, or prone to cavities. Description (from the company website): The old Chocolate Master wasn’t feeling so good. This was the first time in years when he missed an order of his famous chocolate treats. Soon after, the newspaper announced his passing. The great Chocolate Factory closed its doors forever. However, a year later there was an odd rumor that the Master was on the lookout for a successor and left behind clues on how to open the unbreakable doors. In the factory, he hid his greatest recipe. You have one hour to get into the factory, find the recipe and replicate it to become the next Chocolate Master and own the factory. Will you be able to find the clues that the old Chocolate Master left behind before time runs out? Staging Area: Small lobby area with space for photos; conference room where room briefings are done. Metro Access/Parking: This is over by White Marsh in a strip mall. Plenty of parking, but no metro access. Description of the room: You start off in a small room slightly reminiscent of Willy Wonka’s factory. Understanding of the Mission: In order to take ownership of the factory, you need to find get into the lab, find the recipe and all ingredients, then learn how to replicate it. Play if… you love The Walking Dead. Avoid if… you have a fear of hospitals… or zombies… or hospitals with zombies in them. Description (from the company website): “The Rising Dead” is inspired by the hit zombie TV series, with hints of the hospital scene from the first season. This new game is one of our scariest yet, with the added pressure and motivation of a live-actor zombie. Can you get out of the quarantine room into the hospital lab? Bring your friends — you’ll need all the help you can get! Formerly “Resident Horror”, this escape room experience has re-launched as “The Rising Dead” starting in August. A live actor is part of the experience* (incidental, but not intentional, touching may occur due to unpredictable activities of the dead). Description of the room: You start off in a hospital room that is connected to a hallway… and another room with a heavy lock on the door. Understanding of the Mission: Make our way through the hospital, get to the lab, find the medicine, and escape before the zombies get us! Our Suggested Party Size: We’d recommend 6 if you all have escape room experience; 8 if you have some newbies or ERVs (Escape Room Virgins) with you. 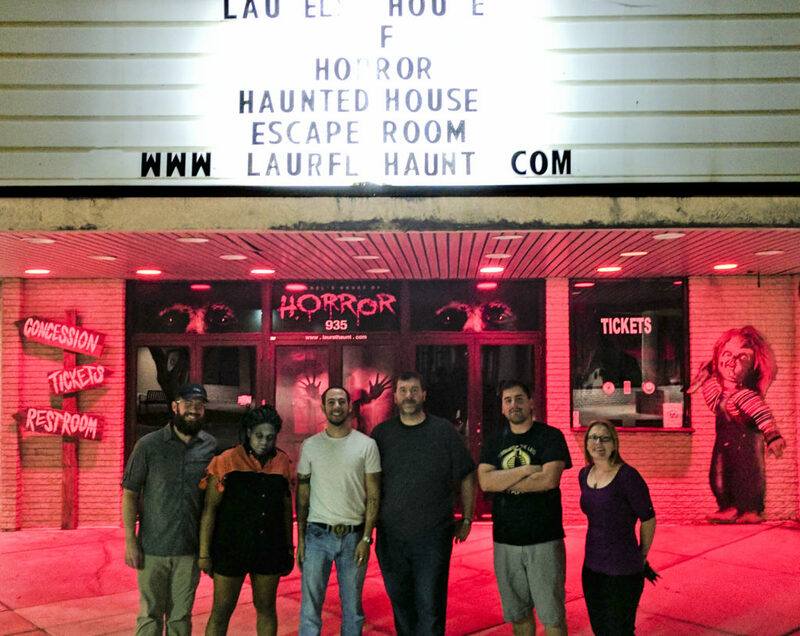 Members of our team (other than the ERG): Mark, Eric, Shannon and three of the employees from Laurel’s House of Horror. 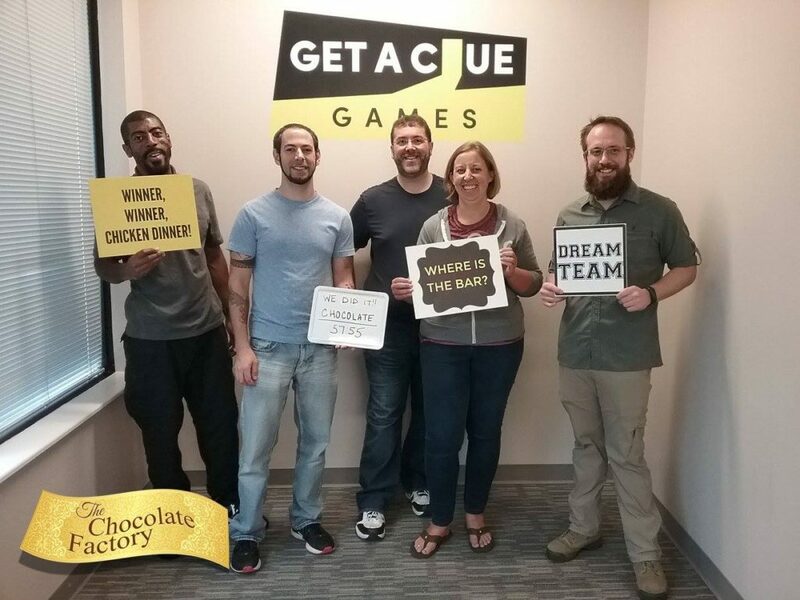 Team Disturbed Friends (Eric, Jason, Mike, Mark, and Shannon) found the cure and escaped the hospital of The Rising Dead! Zombie Heather photobombed us. Where to Eat/Drink Before/After: It’s in a shopping center in Laurel. Lots of places to eat. We had Five Guys before doing one of the previous rooms. Check out our interview with Megan, one of the owners, from Clue Carré while we were in New Orleans on vacation for Halloween. We’ll have reviews of The Voodoo Room and French Quarter House of Curiosities up soon. 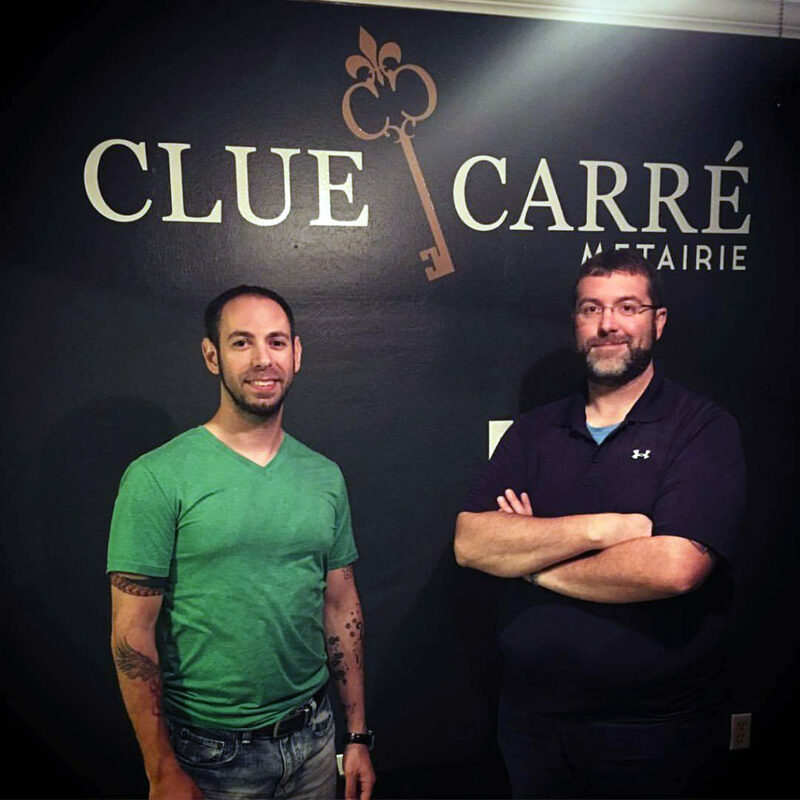 And CONGRATULATIONS to Clue Carré on their grand opening at their Metairie, LA location on Friday, November 17. Check back tomorrow for our review of the Game Museum: Evolution of Games room!